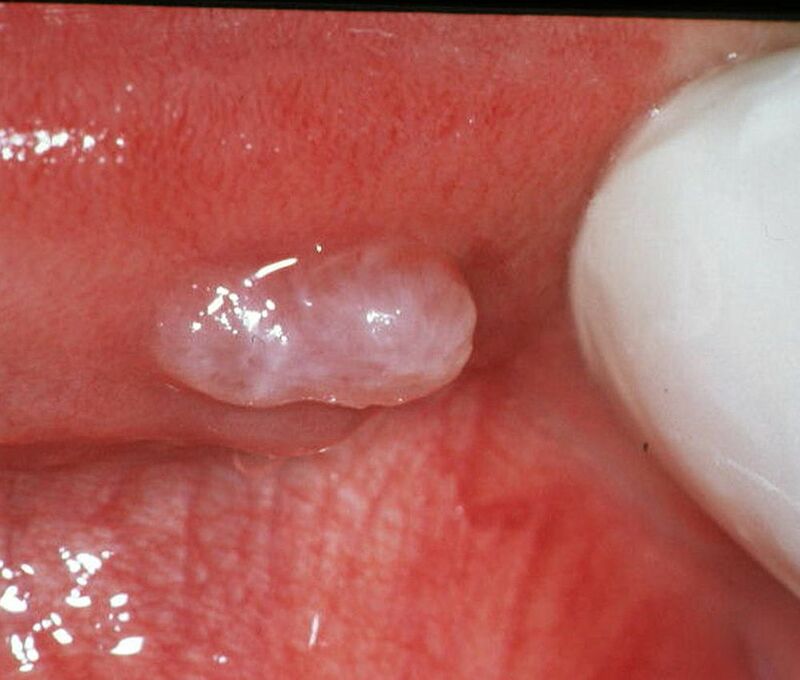 A mucocele is a mucus retention phenomenon of the major and, more commonly, the minor salivary glands. This lesion has also been called a mucus extravasation phenomenon. Although such a lesion can occur anywhere in the oral mucosa, the term mucocele has been applied only infrequently to lesions of the upper lip. Mucoceles are usually associated with the minor salivary glands and hence are less likely to occur on the anterior hard palate and the attached gingiva, which do not typically possess minor salivary glands. Mucoceles are usually formed secondary to rupture of an excretory duct of a salivary gland, which leads to an outpouring of saliva into the surrounding tissues. The resulting pool of glandular secretion is first surrounded by inflammatory cells and later by reactive granulation tissue consisting of fibroblasts. This granulation tissue reflects an immune response. Although there is no epithelial lining surrounding the mucin, it becomes well encapsulated by this granulation tissue and is therefore categorized as a false cyst or pseudocyst. In contrast, a mucus retention cyst is a true cyst, lined with epithelium. This type of cyst appears to be caused by epithelial proliferation of a partially obstructed salivary duct. Complete obstruction of a salivary duct by a calcified mass is called a sialolith, also known as a salivary calculus or stone.